For many communities, the closure of Borders means one fewer place to read books, hear music and drink coffee. For downtown Silver Spring, whose branch anchors the redeveloped area around Ellsworth Drive, Borders was one of the neighborhood's few nightlife options. That's especially relevant right now as residents discuss imposing a curfew on Montgomery County youth due to fears of late-night crime. Like many of Borders' other locations outside of shopping malls, the Silver Spring Borders was open until 10pm during the week and 11pm on weekends. In many of the suburban communities where these stores were located, it may have been the only place open that late. In downtown Silver Spring, where you can count the number of bars on two hands, Borders gave people another place to go, making the streets livelier and safer. Borders didn't just function as a bookstore. It's what sociologist Ray Oldenburg would call a "third place," a sort of gathering space like bars or coffeehouses where people can go solely to socialize. In downtown Silver Spring, Borders stood in for other "third places" like mega-coffeehouse Mayorga, which closed two years ago. On top of that, the store drew people in from Ellsworth Drive seeking something to do between other activities, like shopping or watching a movie. It's likely that the symbiotic relationship between Borders and the rest of downtown Silver Spring helped it weather the first round of store closings. Last week, while writing about Montgomery County's proposed teen curfew, I was criticized for suggesting that the county provide more activities for young people at night. Many commenters here rightly pointed out that troublemakers aren't going to be deterred by a Battle of the Bands down at the teen center. That's true, but potential criminals will be scared off by seeing more people of all ages out in downtown Silver Spring doing legal, socially acceptable things. After all, if you're going to commit a crime, you want as few witnesses as possible. The discussion over unruly youth in downtown Silver Spring has been going on for years, and back in 2007 I advised people who are fed up with it to keep spending time and money in the area. But people need places to spend their time and money, and the loss of Borders means there's one fewer reason for them to visit downtown Silver Spring. The Peterson Companies, which owns the Downtown Silver Spring complex at Ellsworth Drive and Fenton Street, could fill the Borders space with any store, but they'd do well to find tenants that stay open late, keeping the area busy at night. 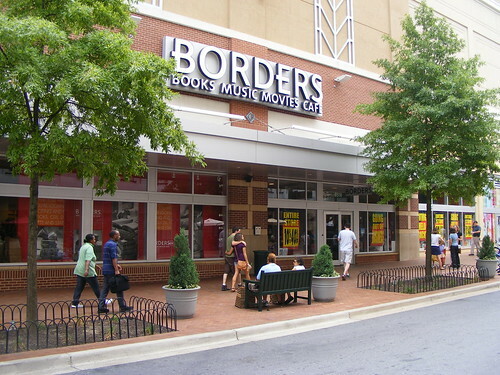 Borders in downtown Silver Spring during store liquidation. But the venue can only make downtown Silver Spring safer, because on a given night it'll bring 2,000 additional people to the area. Even if some concertgoers might be noisy or a little intoxicated, they serve as 2,000 additional pairs of "eyes on the street" to see what's going on and deter potential criminals. The current discussion over a teen curfew for Montgomery County revolves around what young people do late at night and whether they should be at home. But the curfew was proposed to deal with crime, and should be judged on those merits. In downtown Silver Spring, where the county has spent decades trying to create a lively urban district, the best way to deal with crime is not to send law-abiding young people home but, rather, to ensure that more law-abiding people of all ages are out. To do that, we need to have activities in the area throughout the day and into the night. 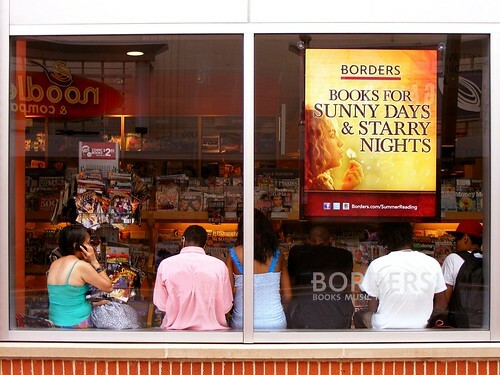 The success of Borders shows that they don't have to involve alcohol or loud music. But they should give people lots of reasons, and lots of different reasons, to spend their time and money in downtown Silver Spring. I'd like to push this a step forward and ask what do you & other commenters think would be the best viable use for the Border's location. Instead of waiting to see who offers to pay rent & agreeing or complaining, this is the time to start advocating for a replacement & perhaps attract a good renter. Because of the exits on both Ellsworth & Fenton, it could easily be divided into one decently sized business & another slightly less huge space. It would be a shame if this was subdivided into a bunch of much smaller stores. Given that the Peterson company isn't going to rent this cheap & I don't see the county subsidizing something at this location, what type of business would be able to pay the rent & be the type of multi-generational third place you're talking about. I'm skeptical that another bookstore/cafe could survive at that location and be open late unless its a chain like Barnes & Noble. Being in walking distance to two movie theaters, Roundhouse, the Civic Center, the future Fillmore, & new library/community center it would be a risk to open another pure performance space. That said, something that allows for informal performances with another draw does have potential. Something following the Politics & Prose model with something to buy & a real speaker-space would have the potential to bring in people & revenue. A well designed gaming place (like Dave & Buster's, but better designed) with stuff to appeal to multiple ages has potential & could easily draw people in before & after movies. Neither of these are great ideas, but what's better? woody brosnan, vice chairman of Safe Silver, I believe that my friend, Tony Hausner, was not suggesting that gangs would flock to the Fillmore to attend concerts. What has been a concern is that is another large group of people who could become victims of crime. Dan, you show a disquieting habit of wanting to ridicule older members of the community. In Tony's case you are attackng someone who fought to make downtown Silver Spring what it is, who fought for a new Blair High School and who is fighting now for a teen center in Silver Spring. If I heard you correctly, I heard you say at the public hearing today that the curfew is necessary to deal with crime after the Purple Line opens. 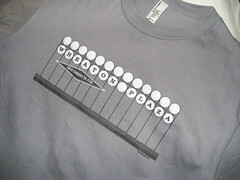 Aren't you a Purple Line supporter? I'm worried that our transit advocates are falling into the old canard that transit brings crime. How about a Busboys and Poets? I would love to hang out there! Maybe half the space could be that. The other half could be... a bar. Wow! It's obvious I'm a 20-something, isn't it? No offense, Dan, but rather than changing the subject, could you please address Woody's point about your misrepresenting Tony's statements on the Kojo Show? To me, that seems like a fairly large distinction. It's possible that he said both, but context might be important on this. We're hearing from the business community, a great deal of concern about the gang activity, particularly we're about to open up the Fillmore music hall. And I think people are concerned that's going to bring a lot of teenagers. And they're concerned that there will be gangs coming along with that group. Maybe I misheard/misread, but that sounds to me like the Fillmore will bring gangs. Thanks for the transcript. Sounds like Hausner is attributing that concern to the "business community," but if that's all there is, then your point in the original posting seems valid. There's a weirdness that can overtake many people when a community undergoes change, especially when it's for the better. I have no doubt that some "criminal activity" will increase due to the Fillmore opening. But, most of that crime will be the kind of stuff that usually happens when you operate a venue that attracts hundreds/thousands of people at a time, parking violations, minor property crime (primarily vandalism), assaults resulting from (drunken) fighting, public drunkenness, and the like. It seems strange to directly associate the Fillmore with increased gang activity, or even significantly more teenagers for that matter. It seems like the target customer for the Fillmore is decidedly north of 20 years old. While I'd hope that the county would take measures to alleviate the potential problems, it's not clear that a curfew is a productive step--at least as far as the Fillmore is concerned. Also, the upside of having a venue like the Fillmore in DTSS (and the increased foot traffic and business it will generate) more than offsets whatever new headaches it may create. Yes, I'm very concerned about crime around the Purple Line BECAUSE I an a Purple Line supporter. The worst thing would be to have a Purple Line that people would be afraid to use. So we need to plan for the security around the stops now. And I've been saying this for two years. I draw your attention to the example of the $14 million Forest Glen bridge over the Beltway at Georgia Avenue. We had two assaults within a month after it opened and nobody would use it until they got the lights working and installed panic stations. Look at the problems DC is having protecting people on the Metropolitan Branch Trail. Do you think people will keep using it if the assaults continue? Transit advocates, of which I count myself as one, need to confront these issues, not pretend they don't exist. The Forest Glen bridge and Metropolitan Branch trail are both secluded (one's under a highway, the other's on a viaduct next to a train). There are no "eyes on the street" to keep either of those places safe and, not surprisingly, bad things happen there. 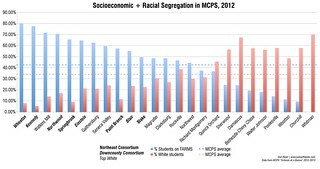 How are these a valid comparison to the Purple Line? I don't disagree there are safety concerns, but these are apples and oranges. C'Mon Dan, Do I have to draw you a diagram? People are supposed to walk to the Purple Line. There won't be big parking lots. The nearest station to my neighborhood will be on 16th street and the Capital Crescent Trail will go under 16th Street. we have had people robbed while walking from the metro to the parking garage on Cameron Street. A couple of months ago a man was assaulted on Wayne and the assailants bordered a bus. You think thugs won't ride the Purple Line? That's not reason to oppose the Purple Line but it is a reason to make sure people can walk to it safely. I agree that we should make it safe for people to use the Purple Line. (And how do parking lots make it safer?) But I think saying the curfew is justified because of the potential for crime on the Purple Line is kind of silly.